Shoney's to celebrate reopening in Acworth. Shoney's, "America’s Dinner Table for nearly 70 years," has reopened its Acworth location. The restaurant, located at 1129 GA-92 (Highway 92, exit 277 off of I-75) was demolished and completely rebuilt. The restaurant quietly opened about a month ago after months of construction and a few delays. Shoney's is across the street from Cabela's, a popular outdoor apparel and equipment retailer, and sits between Hardee's and Waffle House. The restaurant serves breakfast, lunch and dinner. The Acworth Shoney’s is owned by former WCW Heavyweight Champion of the World “Big Poppa Pump” Scott Steiner. Steiner, along with WWE professional wrestler and actor Kevin Nash, will welcome guests and sign autographs at the restaurant's Grand Opening on Tuesday, April 12th. In addition to the autographs, the restaurant will offer guests complimentary Hot Fudge Cake from 3 to 5 pm. The 6,000 square foot restaurant represents a new model for the brand, featuring an updated, contemporary look and feel with a granite bar, stacked stone, and big-screen TVs. The bar features a variety of cold draft beer selections, several wine options and various other alcoholic beverages. Out of eleven Yelp reviews received since the restaurant reopened last month, five were one star and two were two star. Many of the reviewers seemed to have been excited about the opening, but underwhelmed by their actual experiences. One reviewer who identified herself as an Acworth resident started her review by saying "Was excited to try the NEW Shoney's yesterday for lunch." Her review ended "I'm not sure we'll attempt to go there again. Just DISAPPOINTED! :( " Another Acworth area reviewer started "AWFUL, AWFUL AWFUL!!!!!" and ended "Please save your money or go somewhere else to eat." It would be nice to see this restaurant succeed, as I believe the brand still resonates with many. That being said, additional training is seemingly necessary to ensure that the restaurant leaves a better impression with guests. They say you never get a second chance at a first impression... the new building gave them a clean slate, now they just need to deliver. Shoney's, which as a brand dates from 1947, and as a stand alone restaurant from 1954, was purchased by entrepreneur David Davoudpour and his Atlanta-based Royal Hospitality Group in 2007. 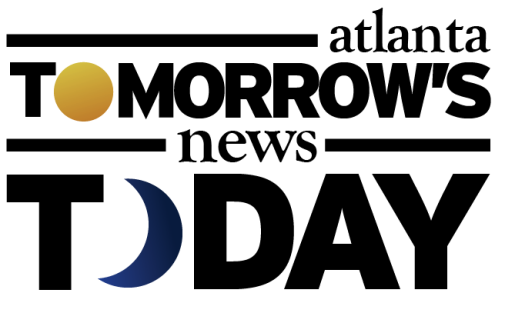 Under its new ownership, the chain, which had previously shuttered dozens of locations around the south, continued to shrink. According to online information, the chain had about 300 locations at the time of the sale and today has about 150. Shoney's has thirteen locations in Georgia including a "Shoney's Too," at Sugarloaf Mills in Duluth that opened in 2013, replacing a Chili's Too. 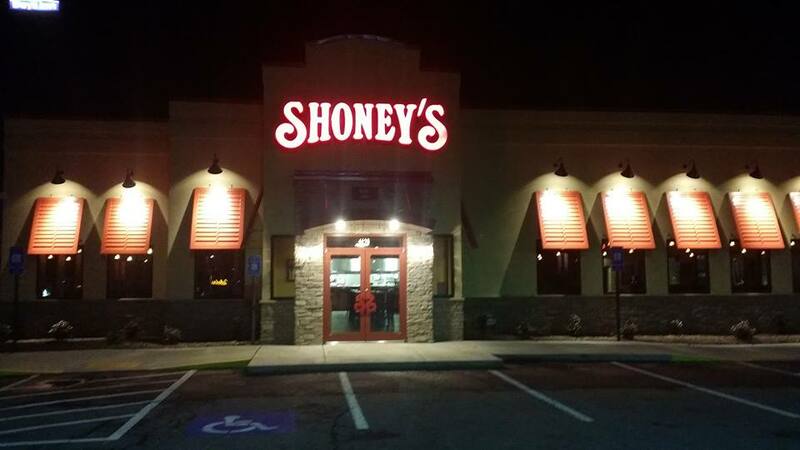 Are you excited at the prospect of having Shoney's reopen in metro Atlanta? Where would you like to see a Shoney's open next? What is your favorite memory of Shoney's? Yes, I too have fond memories of eating at Shoney’s first as a child and then later for the all-night breakfast bar after we left “da club”. It still seems they could do a decent breakfast and lunch business in the right market, but not sure I see it as a place for dinner. This is a new concept for Shoneys in Ga. In addition to the new building with modern décor, they have a full bar! 12 beer taps and featuring a few great local microbrews. it is worth the trip just to get a point of Burnt Hickory Brewery "Big Shanty Graham Cracker Stout"! I hope they still have the breakfast bar! I dined there last month. An entourage of 8 wait staff greeted us with no words, but blank stares until we finally asked if we could sit somewhere. The food was borderline inedible, using salt as the main ingredient. I'd go again just for a beer, but would certainly leave the food to other brave souls. I've been to Shoney's three times since they have reopened. Their food is good and the hot fudge cake is still supreme. The staff has been very nice and welcoming. I hope in the future that they will expand their menu, not enough entrée choices. Beautiful restaurant! My family loved the breakfast bar but it just made me ill to even watch people eat there so they left me at home. I only liked their strawberry pie when I was growing up so they would occasionally bring one home. Really don't know of any reason for me to ever eat at a Shoney's again unless as a last resort. Beer at Shoney's - No Thank You! We were excited to see the Shoney's reopen, the last one at this location was poorly managed and failed because of it. Sad. The new one, though, needs to learn how to make this one work. It takes more than celebrity names, it needs on the ground management. Have eaten there eight times since it reopened in late March. Manager was there once during that time and his absence was problematic. ie, salad bar closing half hour early, making Sunday crowds wait outside because half of restaurant has vacant seating but never used, missing orders, wrong orders, etc. Manager should be here a lot in early days!!  Put out a suggestion box and pay attention to it to succeed here! 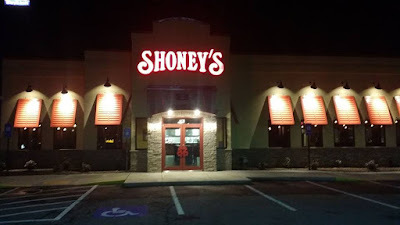 We had a "New" Shoneys open back up in Newnan a couple of years ago. Didnt last long and that one closed. Not the same as it was years ago. I wish they would open the old one on Piedmont that has been shut down for awhile.many new developments are nearby and this would stay busy. of 'Goldfinger' we would go and chow down. Also used to do the hangover breakfast on Piedmont year later.